Small mammals and rodents have teeth too!! Ferrets can develop dental disease as cats and dogs. Tartar build-up can occur with them as well. The same principles apply to ferrets as well. A professional examination and home care are essential – yes, you can brush a ferret’s teeth!! A professional cleaning may be necessary as well. 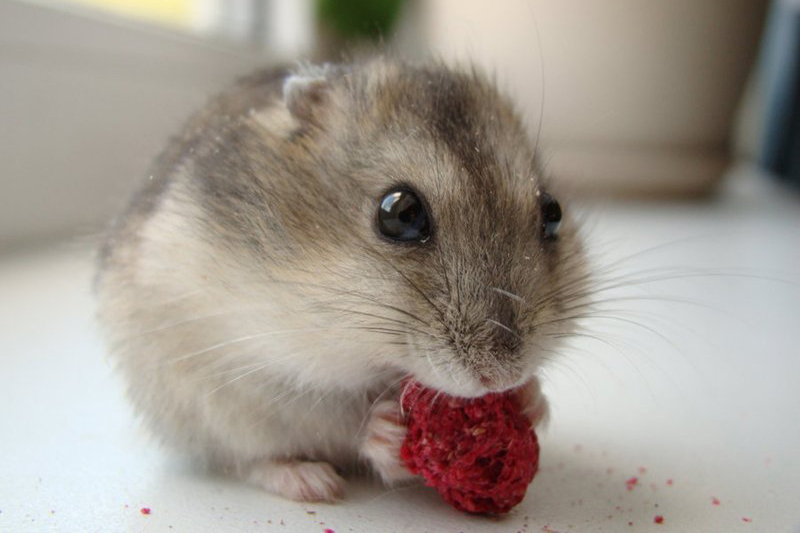 Gerbils, hamsters, mice and rats all have a total of 16 teeth. They have 12 molars (back teeth) which have finite growth similar to dogs and cats. Their 4 incisors (front teeth) are open-rooted and grow continuously. The lower incisors are about 3 times the length of their upper counterparts in the normal rodent. Overgrowth of the incisors may be seen in any of these pets but most commonly in rats and mice. If overgrowth occurs, trimming of the teeth may be performed and will probably need to be repeated on a regular basis. In extreme cases of repeated rapid overgrowth, extraction of the incisors may be attempted, though their deep roots makes this very difficult. Guinea pigs and chinchillas both have 20 teeth – 4 incisors (front teeth) 4 premolars (further back) and 12 molars (furthest back). All 20 of these teeth are open-rooted. They grow continuously and are worn down as these animals eat. Similarly, all of the rabbits teeth grow throughout their lifetime. With all three of these pets, if the teeth are not properly aligned, they do not wear down normally. This can lead to malocclusion where the teeth can develop sharp points. Maloccluded teeth grow as follows: “top teeth towards the cheek” and the bottom teeth towards the tongue. This can lead to abrasions and cuts on the cheek by the upper teeth and on the tongue by the lower teeth. In more extreme cases, malocclusion may actually entrap the tongue. Generally, signs of malocclusion include difficulties eating food, complete anorexia, excessive salivation (“slobbering”) or weight loss. A professional examination is required to determine the exact cause of the problem followed by appropriate trimming. Trimming may need to be repeated on a regular basis. Genetics definitely plays a role in the incidence of malocclusion and incisor overgrowth. Any animals diagnosed with these dental problems should not be used in a breeding program. Nutrition plays an important role in the prevention of malocclusion. Vitamin C supplementation for guinea pigs is important, as they are unable to synthesize this vitamin. Vitamin C helps to keep the gums strong and healthy and therefore will help to prevent abnormal movement of teeth. While diets are supplemented with vitamin C, the vitamin may not be stable in the food at the time of feeding. Offer vitamin C in the water daily , as well as by providing fresh leafy greens high in vitamin C. For rabbits, chinchillas and guninea pigs, a fresh high quality hay (timothy hay for example) should be available at all times. Pelleted foods should be provided as well, the most recent thought is that they should be provided in more limited quantities than is generally practiced. For more exact information on the amounts and types of leafy greens, fruits, seeds and treats to provide, please consult your veterinarian.